In this lesson, we're going to install Ethereum TestRPC along with Web3.js to create a simple user interface that will allow us to interact with our ethereum smart contract. The Ethereum TestRPC is a Node.js Ethereum client for the testing and developing smart contracts. Because it's based on Node.js, we need Node.js installed along with NPM (Node Package Manager) to install it. If either of these commands go unrecognized, visit Nodejs.org and download the appropriate installer. Run it through all of the default options. Once finished, close and reload your console and re-run the commands above. They should now provide you with version numbers. This provides you with 10 different accounts and private keys, along with a local server at localhost:8545. Hit Create. We will need the address of this contract shortly, so leave this window open. Open up your preferred code editor (I use Visual Studio Code) with the project folder we created. Here, you'll notice a node_modules folder, which includes web3 that we installed via npm earlier. Let's create an index.html in the project folder. We're not going to create anything too fancy in terms of a UI, but we'll have some limited CSS, and a UI that consists of a place that retrieves the Instructor's name and age from the getInstructor() function, and a form with 2 input fields for a name and age, which will be set via jQuery from 2 input textfields. // Our future code here.. Going back to the index.html, at the bottom of the file we have an empty <script> tag. This is where we will write the necessary code to work with our smart contract. Normally I would never use jQuery (I'm a big Angular fan), but this keeps things more simple. This code comes directly from the Web3.js Github page. It's saying that if web3 is not undefined, then we'll use that as our provider. If it's undefined (else), we can manually specify the provider ourselves. You may be wondering, how would web3 be defined? 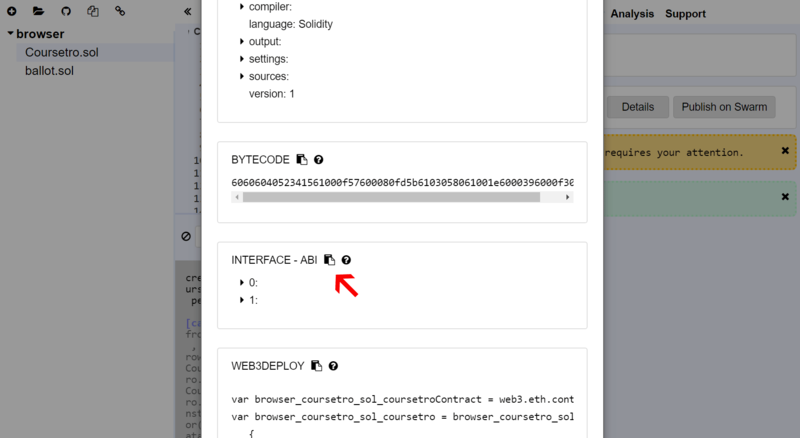 Well, if you're using the Chrome extension MetaMask (which we will use later in this course) or an Ethereum browser like Mist, the provider is automatically injected. Remember when we ran the testrpc console command? It provided us with 10 accounts. We're simply choosing the first account here to use. Next, we need to use the web3.eth.contract() method to initiatlize (or create) the contract on an address. It accepts one parameter, which is referred to as the ABI (Application Binary Interface). This ABI allows you to call functions and receive data from your smart contract. Great. Now that we have the interface for interacting with our contract through the CoursetroContract variable, the last thing to do is to define the actual contract address. We used Remix to create the contract earlier, and it has an associated address. Go back to Remix and click the Run tab, and click on the copy icon next to the contract that we created earlier on the right column. Great. Let's save this, and then (in Visual Studio Code) you can right-click on the index.html and Reveal in Explorer. Double click the index.html to run it in the browser. Notice our 2 functions! getInstructor and setInstructor. We're simply calling .getInstructor and passing the error and result through a callback function. If the error isn't present, we set the html of an h2 element with the id of #instructor to the returned result array (0 = the name, 1 = the age). Next, on click, we call .setInstructor to the name and age values from the input fields in the form. Save it, refresh and give it a go! Wow, we covered a lot! This is the gist of using TestRPC with Web3.js to interact with smart contracts through a browser. In the next lesson, we're going to go back to the Remix IDE to continue learning about how to write smart contracts.